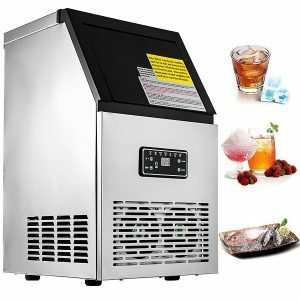 VEVOR 110V Commercial Ice Maker is a 230-watt power very efficient stainless steel model. It is a commercial grade model that can be used in all kinds of commercial settings like bars, restaurants, cafes, supermarkets, bakeries, grocery stores and snack bars. Vevor Ice Maker is suitable for use in North America with a voltage of 110-120 and 60Hz of frequency. It is not a low-cost product but you definitely get what you pay for. It is a very efficient and powerful ice cube maker with a multi-grid ice plate that produces up to 110 pounds (50kg) of ice every day which is plenty for most homes and shops with an ice making cycle of 12 to 18 minutes. You can easily adjust the thickness of the ice production and the duration will be different for each. It can produce thick ice in 11 to 15 minutes, middle thick ice in 8 to 11 minutes and thin ice in 5 to 8 minutes. Vevor Ice Maker weighs 56 pounds (25.4kg) and measures 15.7 x 14 x 24.7 inches and you can set it up as both a standalone or freestanding unit. The single ice plate is made up of 4 x 8 = 32 pieces. The smart LCD display panel lets you set the temperature precisely and will keep the ice as they are- frozen after the cycle is complete with a heat insulation of up to 6-7 hours which will also be great in case of a power failure. The unit is capable of- has sensors for detecting any change in the ambient temperature and when there is a decrease in ice. It is a very sturdy and durable product with a good quality stainless steel exterior that is also easy to clean as you can simply wipe with a damp cloth and soap. In the package, you will find the main ice cube maker unit, a water filter, an ice spoon and an instructions manual. Vevor 110V is a great quality ice cube maker which is totally safe to use and friendly to the environment, with also a food grade water inlet and ecologically friendly and durable rubber tube that will ensure problem-free draining. 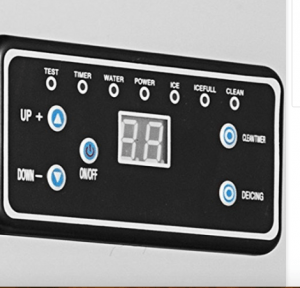 The black LCD display panel has the indicators for water, timer, power, ice, ice full, clean and test and the On/Off, clean timer, deicing, up+ and down – buttons. It has the automatic cleaning function as well as the reservation function for up to five hours. Overall it is a very sturdy, reliable and functional ice maker that is offered at a fair price. Are there any more specs available about this ice maker? My health department wants to make sure it will be usable with the current code. Thank you. Sorry for the delay. But you need to contact the seller directly via Amazon or their own contact details if what you found on Amazon.com (through the links on this page) or via Google are not adequate.